You should be redirected automatically in a few moments, but if not, please click here to see if Spirits of Place: Where historic landscapes collide (with folklore and fiction) has made the transition. There’s nothing like a gathering of like minds to get the keyboard fingers itching to put down a few words! 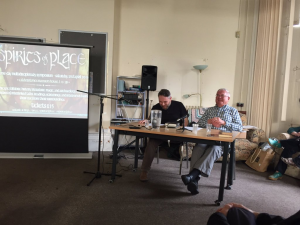 And this past Saturday (2nd April, 2016), the Spirits of Place symposium held at the Calderstones Mansion was just one of those gatherings. The organiser was John Reppion, who’s written a book on 800 Years of Haunted Liverpool, as well as countless articles on Yo! Liverpool, comics and no doubt more that I’ve not come across. His opening talk set the scene for the day, and kicked off a full set of varied takes on Liverpool’s past. John reminded us all that history is embedded in the bricks, mortar, and bedrock which surround us. This is exactly my take on landscape archaeology and history: everything I write about looks the way it does because of what came before, right back to the beginnings of human habitation. It’s a point Richard Macdonald would come back to nearer the end of the day, but John also said that stories are part of this. A recurring theme of the symposium was that we all tell stories – from horror writers to archaeologists! – and that they are all part of the creation and recreation of history. Also of course, history feeds into fiction, and fiction into history. It’s a creative cycle which benefits both sides of it, and which we’d revisit as the day went on. Next up, Gill Hoffs told us about the human stories surrounding the wreck of the RMS Tayleur. The Tayleur sank just off the coast of Dublin, when it should have been sailing merrily south down the Irish Sea on its way to Australia. Gill’s talk was less about ships and shipping (although we found that the Tayleur was built in Warrington of all places! ), and more about the tragic circumstances which caused the boat to be less than seaworthy. You might feel all too familiar with the lackadaisical attitude to testing of ships by certain shipping companies (the Tayleur belonged to the White Star Line, and we all know what happened to their most famous vessel…) and issues of class and gender which meant that only 3% of the female passengers survived compared to 60% of the male. Psychogeography’s (excellent definition here) having something of a renaissance moment right now, what with the likes of Iain Sinclair and J.G. Ballard finding a new generation of fans interested in the darker corners of the urban landscape. Gary Budden and David Southwell gave a two part talk between them on engaging with landscape in less ‘official’ capacities, and how landscape features might be active participants. Whether any of the stories attached to the tree are true in a historical sense matters less than the fact that such stories somehow come to incorporate the tree. The tree seems to be reminding Liverpool that it still exists by, every now and again, playing a part. We also found out that acorns and leaves from the tree were sent to soldiers on the Western Front, expanding the ‘Calderstones landscape’ by many hundreds of miles for a short spell in its life. We explored territory a little further from archaeology at the start of the second half, with Adam Scovell from the University of Liverpool (amongst other places) here to give us a guide to the odder places of Wirral. I’d never heard of the Granny Rock, nor Thor’s Stone near Thursaston village, but these are places from Adam’s childhood ramblings around the area. Adam’s favoured phrase for the stories which surround these historical/geological features is ‘folk horror’, which I think brilliantly sums up the unease and yet homely familiarity which we find in everyday life, especially as kids. He also told us that the Wirral is something of an ‘edge’ or liminal location – it’s not quite urban Liverpool, nor rural Wales, nor “posh” Cheshire, but rather it’s all three and none at all! Liverpool itself is full of these edges, or liminal spaces: the docks border international travel, St James Cemetery was once on the edge of town, where industry was pushed out to, away from the town, and the three large parks (Newsham, Sefton and Stanley) were placed on the edge of the Victorian city, enclosing a little of the rural within urban fences. Our next instalment was from Kenneth Brophy, whose adopted name the ‘Urban Prehistorian‘ was something that caught my eye instantly when I first saw it a few years back on his blog. His blog takes us to those oddly sited standing stones, stone circles and other megalithic monuments which have found themselves with a new life in the middle of modern housing estates or shopping centres. Although there’s a historical element to the study of these features, Kenneth is mostly interested in how modern locals see their monuments: do they trash them, love them, hate them, ignore them? Of course, they do all this and more. In particular, Kenneth talked about the Cochno Stone, which is a colossal (a truly, truly colossal, at 12m x 8m) stone outcrop covered in carvings. The carvings have been made right across prehistory and history, and have been modified, painted, expanded on and damaged across the centuries. Debates have raged as to whether we cover the original to protect it (until when – when the locals have ‘learned’ not to damage it?) or leave it open to the elements. This is a very interesting topic, as heritage professionals often make decisions which affect the general public, and inadvertently make judgements on that public’s ability to treat historic features ‘properly’. Robin Hood’s Stone in Liverpool has rails around it. Why is this, and is it the best solution for that monument. If not, what else should be done? And when we rescue the Calderstones from the vestibule in which they currently stand, where should they be placed, and how close should the public be allowed to get? These are decisions that will need to be made fairly soon, so it’s great to spread that conversation as widely as possible. In a change to the billed roll-call, Ron Cowell replaced Dee Dee Chainey in the running order. Ron is the Curator of Prehistoric Archaeology at the Museum of Liverpool’s Archaeological Services, and has worked for 35 years excavating the oldest of the county’s remains. And, just on the verge of retirement, he’s become involved in perhaps the greatest site of his life, at Lunt Meadows in Sefton. Ron’s easy command of the prehistoric material demonstrates his deep knowledge and experience, but it was when his talk turned to the latest work that he became most animated. A feature excavated at Lunt Meadows is something he’s never seen the like of before for the Mesolithic period in Lancashire, Britain and even Europe as a whole! It’s not every archaeologist who can say they’ve found something altogether new in their field (so to speak), but the Mesolithic is still a relatively difficult period to study, with a lack of sites in north west England (mostly due to urbanisation). Ron pointed out that Neolithic sites are often quite bold and clear – think of the Calderstones themselves, and West Kennet Long Barrow in Wiltshire. But Mesolithic sites are almost not there: just colour changes in the soil might give clues as to the former presence of a wattle dwelling, or pits of shells or tool working which only show through some painstaking archaeological work. At Lunt Meadows Ron has recently excavated an odd feature which consists of a lump of Fool’s Gold, set in an arrangement alongside flint and sandstone nodules in what Ron reluctantly labels ‘ritual’ (a much maligned and vague term in archaeological circles these days). I look forward to hearing more about this in the very near future, although the site itself will probably only be excavated for another year or so. Details of site tours will be forthcoming. Something drilled into us at university was that prehistoric monuments (as well as the things which came later) do not simply disappear when they stop being used, only to reappear in guidebooks in the 1940s. They sit there in the landscape all through the centuries, and often take on new roles in the community. Richard Macdonald, Heritage Stories Maker at the Reader Organisation, and who works at Calderstones Mansion, was here to tell us about the Calderstones in those twilight years between their last use as a burial chamber (probably around 2800BC) and their location today in the Park. They appear on a map of 1568, when they mark the boundary between Allerton and Wavertree parishes. They thus played an incredibly important legal role in the 16th century, even when their original use was lost. Then in 1837 Joseph Need Walker, owner of Calderstone Mansion, commissioned a plan of his estate. The resulting plan marks the parish limits again, but the Calderstones themselves are not marked at all. Richard suggested that this was because, in this age of Science, the old stones were no longer needed as a reference – this accurate map was all that was needed! This again demonstrates the changing fortunes of the monument, as it falls from the gaze slightly. At a similar time – in 1845 in fact – Walker completed the destruction of the tomb by removing the remaining stones from their original settings and placing them in the middle of a nearby junction. 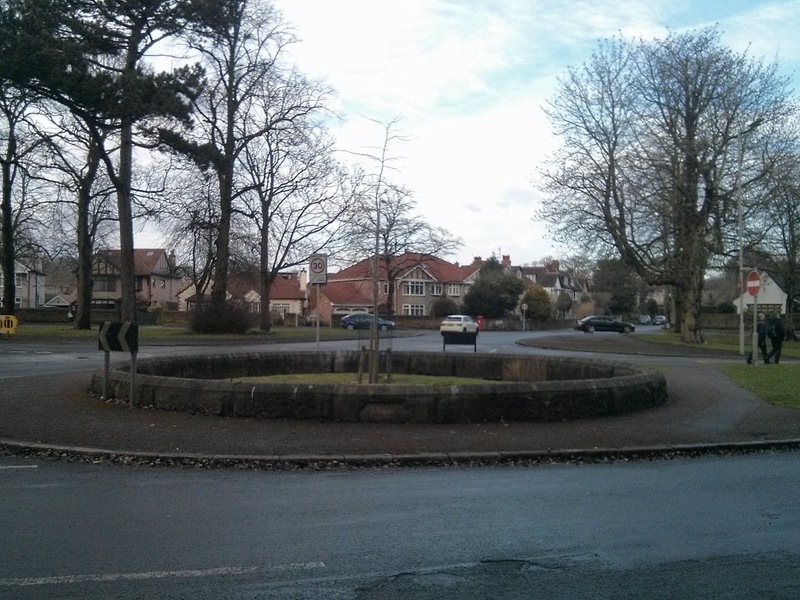 This is the still-existing circular wall at the junction of Druid’s Cross Road and Calderstones Road. Apparently the ruined tomb was a little too messy for Walker’s liking, so he constructed his own ‘druidical’ circle to impress visitors (and establish a little bit of permanency to his estate by drawing on ancient remains). Again, the Calderstones’ use and meaning is altered. Finally, the story comes up to date, with the removal of the stones to the vestibule in 1986 (after an extended stay in Garston for ‘conservation’ from the 1950s). The Stones, like their neighbour the Allerton Oak, insert themselves into other histories at this date, because it is only their presence in the vestibule which saves those last remains of the Harthill Botanical Garden from demolition. Were the stones extending some force of self-preservation here? Perhaps, or perhaps not. Still, the Calderstones are soon to be moved once more, because the vestibule is not a good place, either for their preservation or for public access. Richard is heavily involved in the decision about where they will be placed within the Park, and how close the public will be allowed to get. And so Richard had brought us back to John’s opening point about how our heritage is embedded in the landscape, is influenced by it and in turn influences it. We have inherited the Calderstones in a certain state, and we can only go forward, not back. In perhaps the widest deviation from ‘normal’ archaeology, Ian ‘Cat’ Vincent took us on a spiritual journey around Liverpool’s landscape. Ian is a journalist and magician, and has an interest in the less tangible aspects of the cityscape. He started with Jung’s dream of Liverpool, and suggested that the city has the power to get deep into people’s psyche. Merseyside has been a portal between the Old and New Worlds, a nexus for trade, commerce and migration, and it is this position which created the unique circumstances to give us a certain four-piece musical ensemble and a creative scene which still thrives. He also explored the ways in which the modern world has tried to tame and control nature, but nature keeps coming back. Just as Kenneth Brophy’s prehistoric monuments refuse to give way in the face of modern housing estates, Ian’s nature (for example buddleia) will find a foot hold under bridges, along railway embankments and in the nooks and crannies of the city. How can we incorporate them into our environment, rather than trying to fight them all the time? Ramsey Campbell is an author who has long embedded the landscape of Liverpool in his horror fiction. His slot was a little different to the rest, as he was ‘in conversation’ with our host Mr. Reppion. John prompted him to reminisce about his beginnings in fiction, his influences, and how he came to set his novels in his home city of Liverpool. It turns out that he was so influenced by that master of horror, H.P. Lovecraft, that he set his early stories in Massachusetts, like Lovecraft himself. Needless to say he was advised to change the location to somewhere more familiar to Ramsey, and despite a dalliance with fictionalised Severn Valley towns and villages, started to set his tales on Merseyside. The main discussion revolved around the extent to which Ramsey made up his tales, and whether he invented parts of Liverpool too. He admitted that he did so much research for some books that he can’t recall which parts of the book are based on real events, and which are complete inventions! This is another format in which history and fiction intertwine – for who can say that an entirely made-up plotline has not got historical origins in some article or book read years before? Having seen his books on the shelves of shops around Liverpool, I finally bit the bullet and bought Creatures of the Pool from the man himself. I’d had this on my to-buy list for a while, as it’s supposed to be the book where Liverpool’s landscape is most heavily felt. This was backed up by Ramsey, who told me that if my interest was in the historic make-up of the city, then this is the book of his to get. I’ll let you know how I get on with it! Considering Spirits of Place was apparently John’s first attempt at organising something like this, the day went extremely well. I’ve got to thank John for putting together such a great list of speakers, and the Reader Organisation and Calderstones Mansion for keeping us all fuelled with top notch coffee, tea, hot food and cake. There was a suggestion that this could become an annual event, and if so I’ll definitely be coming back. It was great to see how the disciplines of archaeology, history, fiction and even the edges of the occult can brush up against each other to such great effect. I certainly hope to keep up to date with a few of the speakers, and no doubt we’ll cross paths again in the future. Spirits of Place was largely publicised on Twitter. Even if you’re not active on that site you can browse through people’s reactions by looking through the #spiritsofplace hashtag. That page includes some photos taken on the day too. Featured Image: John Reppion interviewing Ramsey Campbell at the end of the day, by Gary Budden.